Linz 2009 European Capital of Culture - Target markets. An analysis of the target markets came to the conclusion that the pull of a Culture Capital was felt over a maximum distance of 300 km. Additional factors were easy accessibility of the Culture Capital by car, train or plane and the possibility of making use of existing tourist networks and partnerships. Festivals & trade fairs both in Austria and abroad. In 2006 and 2007 communications measures were directed predominantly at Linzers and Upper Austrians to boost interest and a sense of anticipation. The strategy aimed at capturing the imagination of opinion leaders and at making them absorb Linz09’s communications and tinitiate their viral transmission by word of mouth. 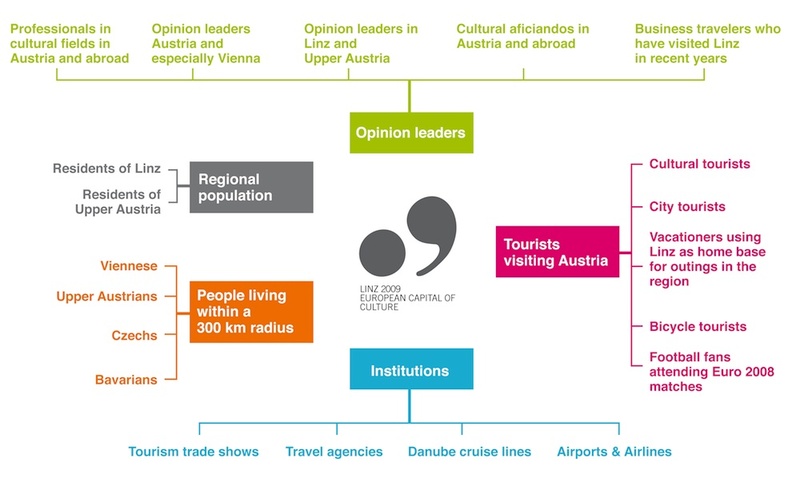 Information events and presentations focused explicitly on opinion leaders in Linz. Their commitment as ambassadors of Linz09 would, it was hoped, ensure that relevant information reached the nationwide circles of opinion leaders, who were also targeted in their own right. Projects such as LINZ TEXAS and nationwide print media, e-marketing and TV campaigns in the last quarter of 2008 made sure that Linz09 was brought to the attention of a rapidly increasing number of people. The southern parts of Germany and of the Czech Republic were included in communications measures as early as 2007. Additional activities targeted people with a manifest interest in cultural matters, such as the visitors of festivals and other high-culture watering holes. Trade fairs also played an important role in Linz09’s marketing strategy from 2007, where the idea was to prod international culture and city tourists to include a trip to Linz early in the year. At a later stage (in late 2008 and in 2009) people holidaying in Austria and bicycle tourists were also identified as target groups.